Cast: Lupita Nyong’o (Adelaide Wilson/Adelaide’s Doppelgänger), Winston Duke (Gabe Wilson/Gabe’s Doppelgänger), Madison Curry (Young Adelaide/Young Adelaide’s Doppelgänger), Evan Alex (Jason Wilson/Jason’s Doppelgänger), Shahadi Wright-Joseph (Zora Wilson/Zora’s Doppelgänger), Elisabeth Moss (Mrs. Tyler), Tim Heidecker (Mr. Tyler), Cali Sheldon, Noelle Sheldon, Yahya Abdul-Mateen II, Anna Diop, Luke Halpenny, Duke Nicholson. Story: Set in present day along the iconic Northern California coastline, Us, from Monkeypaw Productions, stars Oscar® winner Lupita Nyong’o as Adelaide Wilson, a woman returning to her beachside childhood home with her husband, Gabe (Black Panther’s Winston Duke), and their two children (Shahadi Wright Joseph, Evan Alex) for an idyllic summer getaway. Haunted by an unexplainable and unresolved trauma from her past and compounded by a string of eerie coincidences, Adelaide feels her paranoia elevate to high-alert as she grows increasingly certain that something bad is going to befall her family. After spending a tense beach day with their friends, the Tylers (Emmy winner Elisabeth Moss, Tim Heidecker, Cali Sheldon, Noelle Sheldon), Adelaide and her family return to their vacation home. When darkness falls, the Wilsons discover the silhouette of four figures holding hands as they stand in the driveway. Us pits an endearing American family against a terrifying and uncanny opponent: doppelgängers of themselves. Source: Usmovie.com, official site. Details: Us will be the second in a series of thrillers that addresses what Director Jordan Peele calls “social demons.” Much like his debut film, Get Out examines race and racism, this film will center around “these innately human monsters that are woven into the fabric of how we think and how we interact.” While Peele says the movie will follow the same tone as Get Out, it will be a completely different film and not focus on addressing race. According to The Hollywood Reporter, the story focuses on two couples, one white and one black. Winston Duke and Elisabeth Moss are reportedly in early talks for the roles, with Lupita Nyong’o officially confirmed to star as one half of a couple. The Hollywood Reporter also states that Us will be written and directed by Peele and produced by his company Monkeypaw Productions, along with Get Out producer Jason Blum. Source: Popsugar. Studio(s): ESPN Films, Walt Disney Pictures, Walt Disney Productions. Cast: Lupita Nyong’o (Harriet Mutesi), David Oyelowo (Robert Katende), Ntare Guma Mbaho Mwine (Tendo), Madina Nalwanga (Phiona Mutesi). 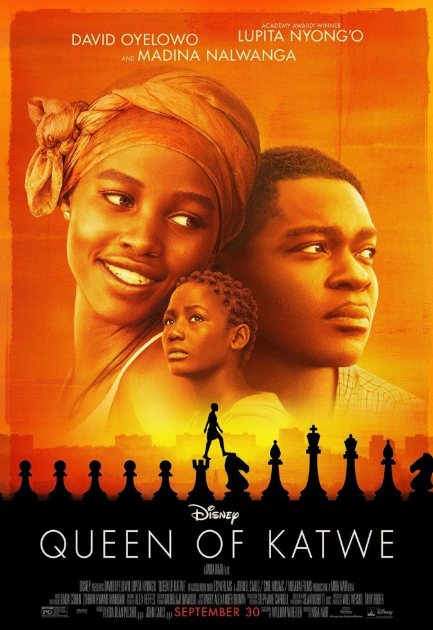 Story: Queen Of Katwe is the true story of a young girl, Phiona Mutesi selling corn on the streets of rural Uganda whose world rapidly changes when she is introduced to the game of chess by Robert Katende a soccer player turned missionary. As a result of the support she receives from her mother, her family and community, Phiona pursues her dream of becoming an international chess champion. Source(s): Deadline; IMDB.